The role of a screenwriter in an adaptation is not just to condense and capture the essence of the novel; s/he writes for many readers. The role of the cinematographer is not just to frame the image and get the exposure right; s/he visualises the internal. The role of a director is not just to captain the ship and guide the crew to create her/his vision; s/he collaborates and listens. Each plays a similar role in the making of a film, to translate and interpret the words of one medium, the novel and/or screenplay, into the cinematic language of another, screenwriting and/or the moving image. Each step along the adaptation of novel to screen informs and influences the next stage. Lawrence Venuti, in his paper, Adaptation, Translation, Critique, proposes that the ‘interpretant’ is a ‘third term’ in what he sees as the ‘competing discourses of fidelity and intertextuality’ in adaptation theory (Venuti 2007, 31). Using his critical framework, this paper dives into the film production process to find evidence of the influence of each stage of production on the next. The paper analyses the process of a screenwriter/director and her/his cinematographer as they adapt a novel to the screen, acknowledging how each is an ‘interpretant’ contributing, collaborating, and influencing the next phase of production. The work of the late screenwriter/director/adaptor, Anthony Minghella CBE (The English Patient (1996), The Talented Mr Ripley (1999), Cold Mountain (2003)), and his collaborator, Australian director of photography, John Seale ACS ASC is used to contextualise this paper. In my former role as a cinematographer I needed only to be the master of one area of film production, the visuals. Now, teaching the field to undergraduate university students, I require a broader level of knowledge, and it is in the teaching of screenwriting to writers and screen analysis to directors that I found an area of study worth exploring. How does the writer communicate to the crew and cast through the minimal poetry of a screenplay? How, in becoming a film, is the essence of a novel kept intact through the many stages of a film’s production? And what actually occurs when a screenplay is analysed by a director and his/her director of photography (DOP)? How do they visualise the internal of one medium into the external of another, translating words into cinematic language? found in two drafts of the screenplay adaptation of Cold Mountain (2002, 2003) by Anthony Minghella CBE. I shall also be drawing on my own interviews conducted with Australian cinematographer John Seale ACS ASC who collaborated with Minghella on three adaptations, as well as published interviews with Minghella on his process. My aim is to find evidence that the reference to Ada (played by Nicole Kidman) in the film as an angel holds something greater than first appears; something more than just the interior thought of Inman (played by Jude Law) when he first sees her in the film’s story. Lastly, I draw on interview material to undertake a close textual analysis of the two versions of the screenplay, the original novel by Charles Frazier (1997) and the completed film (2003), in order to find evidence of where and why the angel reference was used. In my analysis I use Claudia Sternberg’s three functional text stages of the screenplay – property, blueprint and reading material (Sternberg 1997, 48-59) to distinguish the two drafts of the screenplay. This paper builds on Venuti’s work to contribute to two fields of creative practice research – film production and screenwriting. Anthony Minghella adapted three novels to feature length films: The English Patient (1996), The Talented Mr. Ripley (1999) and Cold Mountain (2003). For all three films Minghella was the screenwriter and director and collaborated with the same director of photography, John Seale. My background training is in cinematography and, through this commonality, I have conducted two interviews with John Seale about his work over the past 17 years, the first in 1998; the second in 2014 (six years after Minghella’s untimely death at the age of 54). Minghella was a generous interviewee who shared a great deal about his process and the way he worked with others. Timothy Bricknell’s book, Minghella on Minghella (2005) is a collection of interviews with Minghella that gives insight into the filmmaker’s process. Combined with the unpublished interviews with Seale, this qualitative material gives evidence of the translation and interpretation that occurs when a novel is adapted into a film, providing evidence of the ‘interpretant’. In his paper, Adaptation, Translation, Critique, Lawrence Venuti proposes that the ‘interpretant’ is a ‘third term’ in what he sees as the ‘competing discourses of fidelity and intertextuality’ in adaptation theory (2007, 31). Venuti brings translation theory to film adaptation theory and finds the interpretant in both. Translation ‘communicates one interpretation among other possibilities… decisively determined by the translating language and culture’. A film adaptation, Venuti believes, ‘similarly initiates its inscription of an interpretation by detaching its prior materials from their contexts’ (2007, 29). In film adaptation the interpretant is involved in a process of selecting particular ‘materials and transforming them into the adaptation through the multimedial choices made by the filmmakers’ (Venuti 2007, 33). Venuti’s work acknowledges that in film adaptation there are a ‘number of interpretants’ (2007, 33), and I believe that in the interpretive choices of screenwriter, director and cinematographer that I will find a reason for the existence of the words ‘an angel in a wild place’. I hoped that in my search I would also find evidence of an essence in the novel Cold Mountain (Frazier 1997) that caused these words to be written in the screenplay, in order that this essence could be visualised via pre-production discussions and on-set decisions of the key creative crewmembers, recognising that each ‘multimedial choice’ involves a level of interpretation as novel heads towards the screen. The process of adapting a novel into a film occurs in stages: development, pre-production, the shoot (or production) and post-production. Finally, the film is screened for audiences, who interpret the film for themselves. The screenplay is the first stage whereby the novel is altered, adapted and translated by the screenwriter, the first interpretant contributing to ‘the communication of a univocal meaning inherent in the source text’ (Venuti 2007, 28). Much has been written on the value of the screenplay as a stand-alone text (see Sternberg 1997, Maras 2009, Batty 2014, Nelmes 2014), separating the screenplay from the film it aims to be. Corley and Megel observe that screenplays, ‘are not simply read, but, as with poetry, are received on many levels’ (Corley and Megel in Batty 2014, 11). One level is the interpretive analysis that occurs in pre-production when a director and his DOP break down the screenplay in preparation to film it. As Minghella points out, ‘The screenplay is the notes, and then you play them’ (Bricknell 2005, 10). Olha Dovbush, writing on the semiotics of literature and cinematography, observes the ‘bilingual screenwriter creates a screenplay, a so-called “cinematograph in literature or literature on its way to the screen”’ (Dovbush 2010, 117). She goes on to explain that the screenplay serves as a ‘starting tone to the whole screen talk’ and becomes a ‘uniting element for… operator, artists, composer, soundman, and of course, actors’ all of whom as ‘interpreters… can have their own vision of the movie’ (2010, 117-118). The ‘screen talk’ here refers to the next stage of film adaptation—one that is rife for analysis—pre-production, when director and DOP discuss ways to visualise the internal of the screenplay’s stage directions, translating it into the language of cinema, making it ‘intelligible and interesting to receptors’ (Venuti 2007, 30). The collaboration by director and DOP in interpreting a screenplay is not to discard the words the screenwriter has written, but instead to listen to the writer, to their succinct poetic words that whisper images and sounds, character, visual metaphor and subtext to the would-be-crew and cast they are writing for. ‘…cinema can manage its own poetry. Often this is achieved by manipulating the grammar of film, where shot size, camera angle and movement, the length of a shot, the amount of light on a subject, the palate of colours and, most significantly, the edit replace the syntax of noun, verb and adjective’ (Bricknell 2005, 30). Yet for any adaptation there is still, first, the noun, verb and adjective. For instance, in Minghella’s 2003 adaptation of Cold Mountain, the screenplay states, ‘Inman looks down as the cabriolet halts and Ada steps out, an angel in a wild place’ (Miramax Films 2003, 5). When I first read this sentence, the words ‘an angel in a wild place’ struck me as telling, not showing, indicating the internal perception of the main protagonist, Inman, as he sees Ada for the first time. I wondered how this line came to be written, how it was interpreted by those who read it, and if there was more to the words than first appeared. I was not sure if I would find anything of value in these words, but I wanted to try. What follows is the process I took to discover the literary and visual heritage of these words. My first lengthy interview with John Seale was in 1998, before he shot Cold Mountain, and the second was in 2014, eleven years after the film’s release. Even in the later interview there was nothing specific Seale could tell me about the reference in the screenplay to the ‘angel in a wild place’ or where it came from. Likewise, within the plethora of interviews with Minghella there are no substantial clues as to why Inman sees Ada as an angel. As such, my search has relied on the process around that line, the process of filming and planning to film, as found in the interview material, and a close textual analysis of the original text itself. Seale reveals, above, the extent of dialogue Minghella expected from his collaborators, and confirms for me that a line such as, ‘an angel in a wild place’ did not mistakenly end up in the screenplay, that it signalled something greater than a frame in a film. To find out more I first examine how Frazier’s Inman first sees Ada in the novel. In Frazier’s novel Cold Mountain (1997) the reader does not see the character of Ada through Inman’s eyes until page 72. Up until this point both Ada and Inman are separate characters living their lives within separate chapter headings, dealing with the Civil War that has dragged on for four long years. There is little to connect them but the romantic hope that any single man and woman in a novel will soon meet. In the screenplay, however, Minghella defined his version of the story with the central theme of ‘returning soldier and waiting woman’ (Sunshine, Kaplan and Auiler 2003, 29). This required him to ‘define this central relationship before it was severed by the war’ (2003, 29), therefore bringing the meeting of these two characters to the forefront, within the first five minutes of the film. Investigating how the two characters were introduced to the reader in the novel, I believe, sheds some light on where the ideas of the angel and wild place came from. ‘… at a thing – bird or bush, weed, sunset, mountain —and then scratch at paper awhile as if she were addled enough in her thinking that she might forget what was important to her if she did not mark it down’ (Frazier 1997, 73). Inman ‘dressed himself carefully’ one Sunday morning to attend church ‘expressly for the purpose of viewing her’ (Frazier 1997, 73). His interest in Ada comes at a place in the novel where the reader has already seen Inman four years into the war, allowing us to understand that he is also a person who explores and notices the world. On page one of the novel we read how he lay in a hospital bed and looked out the window at ‘the first smear of foggy dawn and waited for the world to begin shaping up outside’ (1997, 1). Like Ada, Inman understands the value of staring at the things around him, appreciating their worth. After many weeks, ‘Inman suspected that after such long examination, the grey window had finally said about all it had to say’ (1997, 2). In the novel there is time for Frazier to slowly bring the reader into the past, by first showing them the two main characters in their present, harsh lives in the midst of the war. For Minghella, or any mainstream screenwriter/filmmaker, that luxury is not permitted. In the novel it reads as if these two characters have never known, nor will ever know each other, creating a longing in the reader that somehow they will meet. In the film we must know in the first act that they will meet, fall in love and that Inman wants to, but might not, return to Ada after the war. There are some references in the novel that allude to Minghella’s use of the word angel to describe Ada. In the novel Inman goes to church to see Ada for the first time, and in the film he is building a church when he first sees her. The town’s view of Ada and her father as subjects of ridicule is, for Inman, the thing that interests him most; that she may be as ‘other’ as he feels himself. For me this is the first hint that the ‘wild place’ may be the town’s ignorant way of looking at the world, mocking anyone who has the capacity to think, ponder, look and write or draw. But there is more. Inman had but the back of her head to find Ada by… Below where her hair was twisted up, two faint cords of muscle ran up under the skin on either side of her white neck to hold her head on. Between them a scoop, a shaded hollow of skin. Curls too fine to be worked up into a plait. All through the hymn, Iman’s eyes rested there, so that after a while, even before he saw her face, all he wanted was to press two fingers against that mystery place (Frazier 1997, 74). This description of Ada evokes that of a sculpture, the hair ‘twisted up, two faint cords of muscle … on either side of her white neck’, the way pale marble statues in churches are able to show veins and muscles in a delicate, detailed way. ‘All through the hymn, Inman’s eyes rested there’, makes the connection of Inman watching Ada’s pale skin as a hymn is being sung, suggest a link between Ada and something spiritual or ‘other’, perhaps like an angel, as well as a place of rest for Inman. ‘All he wanted was to press two fingers against that mystery place’, the word mystery here links to the ether, the place where angels come from, and two fingers is the number of fingers saints and disciples, and Jesus himself, are often depicted in paintings and statues, as holding up to bless their followers. The All he wanted part of this sentence hints, for me, at the idea that for Inman Ada is safety. She is home; she is a ‘place’ not to be left, the place to return to. As Inman keeps his gaze upon the back of her neck, he listens to Ada’s father, the minister Monroe, give the same sermon he has given since he first arrived in the town, that of the ‘prime riddle of creation: why man was born to die’ (1997, 74). On one level this foreshadows what comes for Inman, and for that matter Monroe—death— although neither man, nor the reader, know this yet. On another level the sermon continues to link the association of Inman first seeing Ada with a sense of a world beyond the one they are in, a greater concept, the riddle of creation: where there is life there is death, where there is physical there is spiritual. This section of the novel holds an essence of the idea that Ada is likened to something spiritual, something saviour-like, something that Inman has found peace in, even before speaking to her, or even seeing her face. I argue that in adapting the novel to a screenplay Minghella, influenced by this essence, found one simple poetic word, a word that has associations with centuries of art, sculpture, photography and film; a word to sum up this entire section of the novel, and a way for the key creative team (and here the costume designer Ann Roth must also be acknowledged), as well as the actress herself to be inspired by—angel. Figure 1 ‘the doing of it: Part Two Production Sunshine, Kaplan and Auiler 2003,74-75. Other than her father, it appears that Inman is the only one who can see Ada for what she is, unique, clever and separate from the likes of those ‘wild’ heathens who believe writing, drawing and watching the world is for those that are ‘addled’ (Frazier 1997, 73). Yet there is evidence that Minghella may have been referring to another type of ‘wild’ that exists in the novel. Sternberg’s three functional text stages of the screenplay (property, blueprint and reading material) allow me to highlight the changes that occur in two drafts of the screenplay and how the notion of wild place might have evolved. The earliest version of the screenplay I have for analysis is dated February 2002. I refer to this as the blueprint version as it was written during the pre-production phase, a time when Minghella and Seale were discussing and debating the screenplay and how to film it. On page one Inman sees Ada for the first time as she emerges from a cabriolet, ‘Inman, using his shirt to staunch his battered nose, looks at Ada, astonished by her. An angel in this wild place’ (Minghella 2002, 1). The same scene in the reading material stage is written as, ‘Inman looks down as the cabriolet halts and Ada steps out, an angel in a wild place’ (Minghella 2003, 5). There is the slight difference between this wild place and in a wild place, but both tell the reader how to see and interpret Inman’s view of Ada. The blueprint (2002) version begins the story in the town of Cold Mountain, whereas the reading material (2003) version—the one closest to the released film—begins with the Battle of Petersburg. It is the blueprint screenplay that serves the most use for my analysis, as it is an earlier draft written before filming began, and as such has more in it than the final edited film could include. The blueprint screenplay merges a number of the novel’s scenarios that involve the character of Swimmer, a Cherokee boy who, in the book, Inman meets when they are both sixteen. While he has a very small part in the final film, it is important for my analysis to point out aspects of Swimmer’s role in the original narrative, the novel, to show where the wild place may have come from. In the novel Inman, at sixteen, meets a group of Cherokee boys and some young white men up in the mountains while on a job taking heifers to graze there. Together the youths eat, drink, gamble and play, Cherokee versus white, a ‘vicious ball game… with racquets as if with clubs’ (Frazier 1997, 15-16), with the Cherokee winning the game. From this meeting Swimmer and Inman remain friends, and we later meet them together at war. In the blueprint (2002) version of the screenplay the game occurs on the same day that Inman sees Ada for the first time. In this earlier blueprint version of the screenplay adjectives such as vicious, stripped, muscular, steaming pack, verbs such as charging and collides, and phrases like, blood pouring from his nose, indicate the level of wild violence that must have been included for a reason. Amidst the violence of the game between the young men, and the horror of the curse that hovers in voice over, Inman lays eyes on Ada. None of this scene makes it into the final film, leaving the friendship between Swimmer and Inman with no backstory or explanation. Yet the combination of Cherokee versus white men in a violent game ending with Inman’s face bloodied, and the curse by Swimmer (that he later tells Inman he can ‘use on the Yankee before battle’) (Minghella, 2002:1), are likely to have been kept in this draft for two reasons. First, the friendship with Swimmer reveals an aspect of Inman that was no doubt important for Minghella, showing a man capable of befriending a Cherokee whom others in his community would not. Such a man is, perhaps, worthy of someone like Ada. Second, and possibly more important to my analysis, I began to ponder if this blueprint screenplay was setting up a visual metaphor that Minghella and his crew could use throughout the entire completed film, a visual metaphor of something ‘good’ amongst the ‘bad’. The game and the curse show the ‘wildness’ of Inman’s world, the world of Cold Mountain. It also foreshadows the brutal war that is to come. All this exists in stark contrast with the seemingly ‘civilized’ and ‘good’ world Ada and her father have come from, Charleston. I argue that when Minghella as the ‘madman’ (Bricknell 2005, 13), wrote the screenplay and the line ‘an angel in a wild place’, he left it as a message to himself as director, making sure he would remember all that he had taken from the ‘essence’ of the novel, and from his own earlier drafts of the screenplay. Thus, when collaborating with his key creative crew they could collectively find a way to bring the metaphor of goodness and light, of the angel and her place in Inman’s wild, dark world, into the film, and show the audience through visual means what words had so easily described. It wasn’t until I found an article by John Calhoun in the American Cinematographer magazine (2004) that my search was able to go deeper, and it led me to the importance and role of the premise. Lajos Egri’s observations on premise (Egri 1946) are specifically related to the theatre, yet are universal in terms of story. Egri tells writers, ‘You must have a premise—a premise which will lead you unmistakably to the goal your play hopes to reach (Egri 1946 (2004), 6). What is notable in Egri’s moral premise examples are the balance of opposites, ‘love & death, ambition & destruction, faith & pride’ for the plays, Romeo & Juliet, Macbeth and Shadow and Substance respectively (1946 (2004), 3-5). For Stanley D. Williams, premise is the ‘explicit or denotative story line of a film’ (Williams 2006, 3). In my search for the meaning of Minghella’s words via a close textual analysis of the original novel, I believed that they served as a visual metaphor of good versus evil, capturing all that was in the original scenes in the novel, and that, perhaps, was all. However, when I looked more closely at what John Seale as cinematographer did with the frame, the lens, lighting and, most importantly, film stock, I believe there is evidence that ‘an angel in a wild place’ represents, and establishes, the premise for the entire film. ‘Obviously my visual style has been mediated by John Seale. As well as the lighting cameraman, he also operates the camera, so a lot of the framing is a strange marriage of the director’s and cinematographer’s taste… He is the witness of it much more physically than I am. How he moves the camera, adjusts the zoom or lens size is not something generally, that I try and control (Bricknell 2005, 95). ‘“The film deals with two journeys, and Anthony (Minghella) always said Inman’s journey was 300 miles, whereas Ada’s was 30 yards”, says Seale. “They are two quite harsh journeys…” To contrast the darker moments with the lighter ones, Seale adds, “I opted for the first time in 18 years to use two stocks on a production instead of one. I normally use a high speed negative and nothing else”. For Cold Mountain, Seale chose two different 500T stocks, Kodak Vision 5279 and Vision Expression 5284. “When I compared the two, I found that the 84 is the slighter softer and less contrasty negative”, he says. “I used 84 for the good times in the characters’ lives, and 79 for the hard times.”’ (Calhoun 2004, 69-70). Through the use of two different film stocks Seale enabled viewers to see a photographic ‘physical’ difference between the opposites that exist in Minghella’s Cold Mountain. Calhoun and Seale use the terms good and bad, lighter and darker, alluding to Seale’s contribution to what could be seen as the premise of the film. I believe that in Minghella’s version of Cold Mountain there is evidence of Egri’s balance of opposites that relates to good and evil, and that the premise would read something like; Where there is dark there is light, or Where there is bad there is good. Hopefully my close textual analysis has revealed how and why Minghella as screenwriter/director/ interpretant came to write the line ‘an angel in a wild place’ and why the line influenced Seale’s shooting style, framing and lens size, not just for this one scene, but for the entire visual style of the film, as evidenced in his choice of film stock. The premise that where there is bad there is good begins with the scene of Ada as an angel in a wild place, and continues throughout the film until the final moments where Inman is dead, but Ada and their daughter are alive. In searching for the source of the words ‘an angel in a wild place’, we find an example of how the essence of a novel can be kept intact through the many stages of its journey to the screen. That these words may also hold the premise for the entire film, and that the role of the interpretant in film adaptation involves more than a single act of translation has also been discovered through the analysis. Film adaptation involves many stages of interpretation beyond the traditionally limited novel and completed film analysis; each stage of film production from concept, development, pre-production, the shoot and post-production, is led by individuals and creative teams that influence the next stage. Through qualitative interview material and a close textual analysis of novel, screenplays and the completed film of Cold Mountain (2003), this paper touches on what could be an extensive research area whereby editors, sound designers, cinematographers, screenwriters and directors are able to dive in and pick through the film production process to discover the role of the interpretant, and how their individual and collective collaboration informs and influences each stage as a novel heads towards the screen. Albrecht-Crane, Christa and Dennis Cutchins, eds. 2010. Adaptation Studies – New Approaches. Madison, Teaneck: Fairleigh Dickinson University Press. Batty, Craig (ed.). 2014. Screenwriters and Screenwriting: Putting Practice into Context. Basingstoke: Palgrave Macmillan. Bricknell, Timothy, ed. 2005. Minghella on Minghella. London: Faber & Faber. Calhoun, John. 2004. “A Long Walk Home: John Seale, ASC, ACS, Shoots a big-screen Version of the Bestselling Novel Cold Mountain.” American Cinematographer Magazine 85(1). Dovbush, Olha. 2010. “The Screenplay of ‘Oliver’s Story’ (E. Segal): On the Edge of Literature and Cinematography (a semiotic view)”. International English Studies Journal (Literary and Cultural Studies, University of Rzeszow), 7:116-125. Egri, Lajos. 1946 (2004 printing). The Art of Dramatic Writing Its Basis in the Creative Interpretation. New York: Touchstone. Frazier, Charles. 1997. Cold Mountain. London: Sceptre Paperback, Hodder and Stoughton. Ingelstrom, Ann. 2014. “Narrating Voice in the Screenplay Text: How the Writer Can Direct the Reader’s Visualisations of the Potential Film” in Screenwriters and Screenwriting: Putting Practice into Context edited by Craig Batty. Basingstoke: Palgrave Macmillan. Lewis Corley, Elisabeth and Joseph Megel. “White Space: An Approach to the Practice of Screenwriting as Poetry”, in Screenwriters and Screenwriting: Putting Practice into Context edited by Craig Batty. Basingstoke: Palgrave Macmillan. Maras, Steven. 2009. Screenwriting – History, Theory and Practice. London: Wallflower Press. Miramax Films (2003) Cold Mountain. New York: Grove Publishing. Minghella, Anthony. 2003. Cold Mountain Screenplay. New York: Miramax Books. Nelmes, Jill, ed. 2011. Analysing the Screenplay. London: Routledge. Sternberg, Claudia. 1997. Written for the Screen: The American Motion-Picture Screenplay as Text. Transatlantic Perspectives (8). Tubingen: Stauffenburg. Sunshine, Linda, Larry Kaplan and Dan Auiler. 2003. 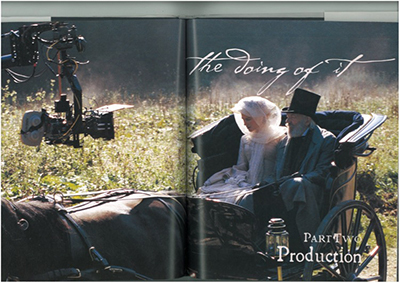 Cold Mountain – The Journey from Book to Film. New York: Newmarket Press. Williams, Stanley D. 2006. The Moral Premise – Harnessing Virtue and Vice for Box Office Success. California: Michael Wiese Productions.